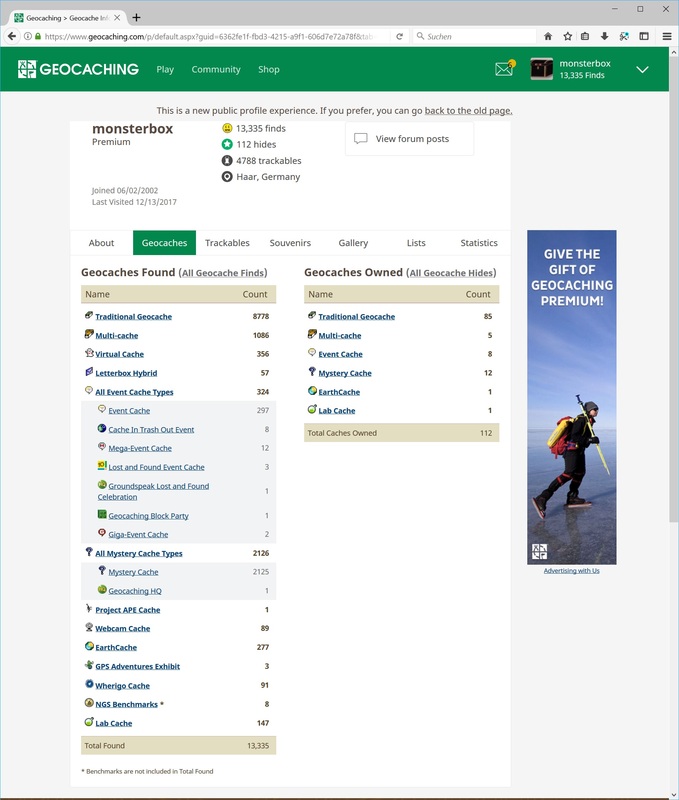 We’re excited to announce that you can now customize the cover image on your Profile and Dashboard on Geocaching.com. To customize your image, visit your Profile Settings and upload a photo in the “Cover Photo” section. The new photo will only appear on the new version of the Profile and Dashboard on web. Hope there's a way to restore the About section. This was not worth the loss, even though I like the change. This was not tested thoroughly, it seems. I'm really saddened by losing all that info. Oh great .. me too! Let me be blunt: This must the worst blunder in a long series of botched initial releases of new features . I mean, how the ---- could testing overlook this?!? IF YOU TRY THIS UPLOAD EDIT - DON'T HIT SAVE UNTIL YOU CHECK THE ABOUT BOX. If it's got your custom text, copy it out to note pad or somewhere, then try uploading a cover photo, because YOU MAY LOSE THAT CONTENT if the save is buggy. And if that's the cause, now what for those of us that just lost all our custom About text?! Sounds like this needs to be rolled back ASAP unless it looks like it can be fixed within a few minutes. Data loss isn't a good thing. I also had my detailed profile About information disappear when I uploaded the photo. Not happy. We are rolling back the site now and will investigate the cause and how to restore the missing content. I really like the cover photo feature, but I do hope you get the About-info restored and the bug patched. *phew* hope the content can be restored! I tried to get my old "about" text back from the archive.org, but it didn't have my profile page. And now that it has my profile page, it shows only "Sorry, you must first log in to view this profile." So that wouldn't have worked anyway. Sigh... Feel free to revert my profile settings. The website has been rolled back and we have identified the issue that resulted in the content going missing. We are working to restore the content for all accounts that were affected. I would love it if you could make the cover photo cover the page, like in the attached example. That looks so much better! I do hope they consider the change to expand the image all the way. As a side note, after I'd uploaded my image, my profile didn't reflect the cover photo at all. Tried refreshing and hard-refreshing a few times. For those of us who didn't try it, what did it actually look like? Was the image clipped on the left and right so it only filled the same width as the "About" to "Statistics" tabs? Yep, pretty much, and in the photo I chose I was standing on the left of frame so I ended up mostly hidden behind my avatar. Just noticed another bug. If I hover on the cover photo on someone else's profile, I still get the "Edit" button. And Groundspeak also restored it on the live site. Thanks! yes yes yes! Also good catch on the staging site. Forgot about that one. Hi again! Everyone's profile bios should now be restored. I am very sorry for the inconvenience that this release caused and thank you for your patience. The Profile page was not rolled back so anyone that uploaded an image will still see it on the website. The "Edit" button is showing up on the Profile page for all users, but will take you to your own account settings page. This will be fixed soon so it only shows on your own profile page. The Account settings page was rolled back to stop additional people from updating their profile and losing their bio. 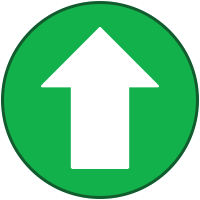 Everyone's profiles have now been restored using a back-up from last night. The issue was caused when the mapping to the database got mixed up between reading the profile bio and then saving it back to the database. The database mapping is being fixed in preparation for re-releasing the account settings page with the cover image upload. One thing I noticed was that the bug did not truncate my current profile text. Instead, it replaced my current profile text with a much older version. First, is your profile text correct now? Second, yes this was caused because the update was reading from a database field that had been deprecated long ago, but was writing to the current database field. For most people the result was an empty profile (because they had no content in the old database field), but for anyone who had previously entered text before we migrated to the new database field their old profile text was resurrected. And in a few cases where the profile text was the same in both the old and new fields there was no perceivable impact. Yes, to the best of my knowledge/memory, my profile text is correct now. The bug that caused the profile text to disappear when a cover photo was uploaded has been fixed. The cover photo setting is available once again for anyone who would like to add/update their photo. As a bonus you will get to keep your profile text as well. Please let us know if you come across any issues. We have completed the fix to hide the "edit photo" link when viewing someone else's profile and will deploy that change first thing tomorrow morning. Excellent, thanks for being so quick on the ball. As a bonus you will get to keep your profile text as well. Thanks for the fix. I hadn't done our cover photo yet, looking forward to trying it out. I uploaded a photo from my camera, and it loaded upside down as my the background image. Surely there's a way to test for "up" in modern computer software....? I had to edit the photo, rotate left, then back right, save the file and re-upload it for it to display properly. 1. Main part is way too big now. I roughly always need to scroll down now. And it is shown in every tab, not just the about tab as in the old version. For me that's waste of space plus the need to always scroll now. I'll stay with the old version, works better for my needs. 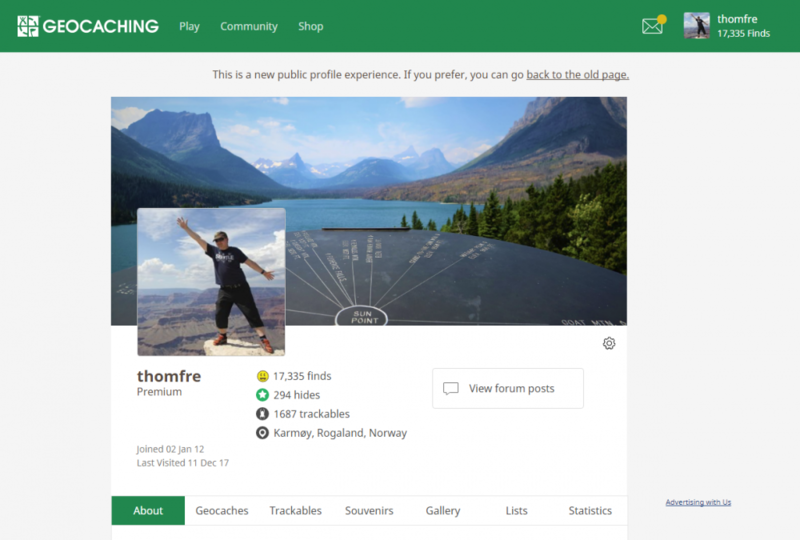 Unlike the old version, the new profile page only shows the links that are relevant. For instance, if you are looking at your own page it does not make sense to display the email and message center links. If you look at the profile page for another player who is not premium you will see all of the links that you are missing. ...if you are looking at your own page it does not make sense to display the email and message center links. If you look at the profile page for another player who is not premium you will see all of the links that you are missing. Ok, makes sense! But I'm sorry, the "header" still is way too prominent in my eyes. If I'm looking into one's profil I usually don't care too much about that info but more about their statistics. And even on my pretty big (28" UHD) display only less than half the height is used for that part now. And as I wrote: I now will be shown on top of EVERY tab. Not an improvement but a backdraw. Seen from a pure technical view I wonder why you changed that at all. Up to now I don't see any new feature, just a higher waste of space (again). Ok, the new backgrund picture might be nice for some people, but is THIS really worth the change? Sorry that for, just my personal view! 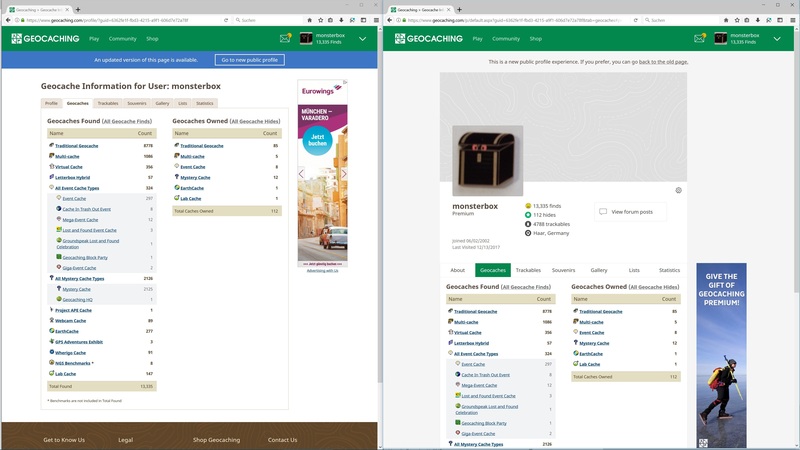 Technically you're right It simply was way easier for me to compare MY personal profile as I know how it should look like So I have been comparing the new and old version on my 2 screens and just wondered what has been changed. My main complaint anyways is the huge waste of space for the least important part of the profile info. In the old view all my geocache info can be seen on my screen. In the new version that doesn't exactly work. Ok, it jumps down and doesn't show the background and profile picture any more if I chose anything other than the About tab. But it that case I again need to scroll up to be able to change to some other page later as this also hides the main menu. Eek! I never really looked at the new profile! My profile photo is oddly stretched and blurry, and even on a big screen more than half of the content is menu, whitespace and my profile photo. Quite honestly: what's the point? The avatar must be a square photo, best at about 350x350 pixels. Yet even a rectangular avatar photo seems cropped OK in some places on the site, not the Profile photo. I had to overhaul my avatar for the new system. It would be nice if one could rotate the uploaded picture. I have still lost all my banners when I uploaded my dashboard photo. How can I retrieve them? Yes. The ability to do this on the page itself would be quite welcome. If anyone is having difficulty with their profile settings, do not report this to the volunteer forum moderators - volunteers can do nothing to help in your specific situation. Either post here in this thread, or write to Geocaching HQ via the Help Center. It was a nice surprise to see your picture from one of my caches used as your cover photo, thomfre! Thanks for the update, Groundspeak. More pictures, the merrier! 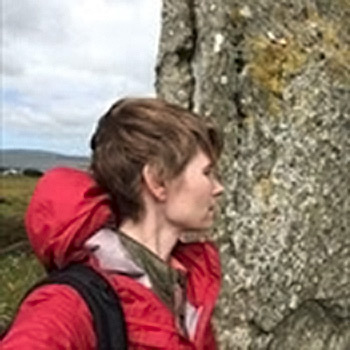 I enjoyed looking through my geocaching photos to find a cover for my profile page. I'll probable update it often.